Over the past two years, more than 150 German research institutions have formed a coalition to encourage scientific publishers to conclude new licensing agreements for Open Access scientific content. The negotiations of the DEAL consortia are the most comprehensive Open Access action to date in Germany and possibly worldwide. In July it was announced that the negotiations between DEAL and Elsevier, the largest scientific publisher, were suspended for the second time. Although Open Access seems to be gaining speed, it is still unclear what the future will look like. 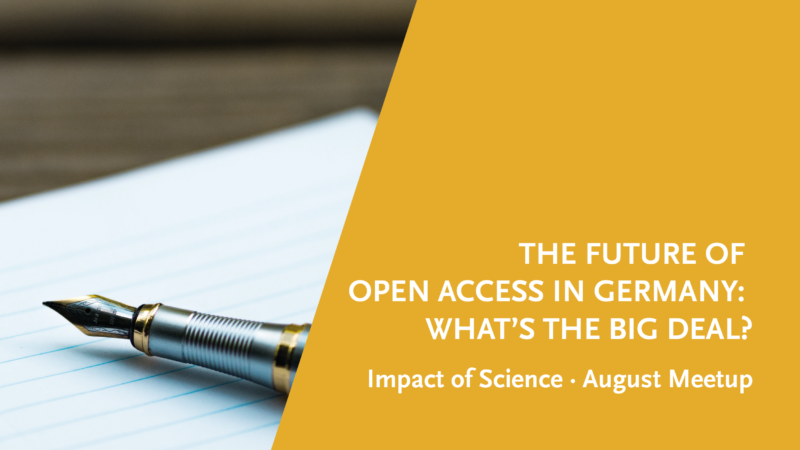 At this meeting we will discuss the DEAL negotiations and the future of Open Access in Germany with Dr. Nick Fowler (Chief Academic Officer of Elsevier) and Gerard Meijer (member of the Wissenschaftsrat – scientific council). The event will be held in English and will start at 7 pm. Please register through our Meetup page. Disclaimer: By signing up you consent to be photographed during the event and to the use of the content in connection with the promotion and public relations of the event.